The Daniel Sandler Watercolour Crème Rouge blusher gives you a beautiful flush in seconds with its ultra-blendable texture and long-lasting, professional finish. The satiny, creamy texture is not greasy in the slightest, and melts onto skin with ease. It blends beautifully over naked skin just as well as it does on top of a base, leaving a hint of flattering, natural-looking colour. The gorgeous diffused effect and the perky colourways of the Watercolour Crème Rouge blusher infuse the complexion with a youthful flush that knocks years off. The Watercolour Crème Rouge is perfect for all skin types, but is especially wonderful for those with drier skin as the creamy texture is non-drying and extremely comfortable. Apply with fingers for a quick and easy complexion enhancer, or with a blush for a more sculpted finish. Daniel Sandler Watercolour Crème Rouge Blusher is rated 4.9 out of 5 by 7. Rated 5 out of 5 by Rouge from Very creamy blush I much prefer this to the DS liquid blush. 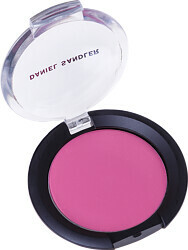 It reminds me of the becca Cream Blush that was discontinued, as the texture is very creamy and the colour intense. Just dab your finger on it, apply a little, and then build up if you need to. It's very easy to apply because of the texture, and the bright pink colour isn't too full on once it's on the skin. My one did seem to have a grainy texture, but it doesn't make any difference to application. Rated 4 out of 5 by Housemaid from The Daniel Sandler Ceme Rouge Blusher I have just purchased the above mentioned item, and am very pleased with it. The parcel came well wrapped and the delivery time was great. I am sure that I will continue to be pleased with my purchase. Rated 5 out of 5 by N009 from Hot pink is a lovely colour! I do love this! I use it with my Real Techniques stippling brush. One dab on the colour is enough to brighten my cheeks. It seems a little small (the product) and the packaging is a flimsy little plastic thing. Could've been a little better I guess but the blush itself is great! I'm terms of longevity I'm afraid it disappears after a 3-4hours. But don't add more colour just to improve it's staying power because you can end up looking like a clown! Hit Pink is an extreme neon-ish colour on the palette but looks wonderful on the skin. I think it would suit every skin type.